Science activities are fun and easy to do! Make sedimentary sandwiches, build paper rockets, and watch dancing raisins. 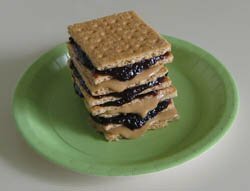 In this science activity you will create your own sedimentary layers using graham crackers, peanut butter and jelly. These are just a few of the many fun activities to do with just the click of a mouse! Click on the links below for more interesting activities . Break two graham crackers in half for you have for pieces. Place one on a plate. Spread peanut butter on the first piece and put it on the plate with the peanut butter on top. These are the first 2 layers of your sedimentary sandwich. Spread the second graham cracker with jelly and place it on the peanut butter. Repeat until all your sedimentary layers are stacked on the plate. Sedimentary rocks form in layers. During rainstorms and floods dirt, silt and sand are carried downstream to be deposited in deep ocean basins and lake beds. The layers are stacked one on top of the other with the deepest layers on the bottom just like your sedimentary sandwich. More science activities you might like to know about! Do you know how scientists determine if a dinosaur walked on 2 legs or 4? Put a few raisins in a glass and add soda pop and watch them dance! Build paper rockets and watch them fly away with a puff of air. These and many other fun and fascinating activities are listed below. Fun Activities, Leaf Placemats Create your own one of a kind leaf placemats in this fun and easy activities. Science Activity Links to activities on this page include building bridges, creating spouting water, growing sugar crystals and much more.